Mathematical scripting languages are commonly used to develop new tomographic reconstruction algorithms. For large experimental datasets, high performance parallel (GPU) implementations are essential, requiring a re-implementation of the algorithm using a language that is closer to the computing hardware. In this paper, we introduce a new Matlab interface to the ASTRA toolbox, a high performance toolbox for building tomographic reconstruction algorithms. By exposing the ASTRA linear tomography operators through a standard Matlab matrix syntax, existing and new reconstruction algorithms implemented in Matlab can now be applied directly to large experimental datasets. This is achieved by using the Spot toolbox, which wraps external code for linear operations into Matlab objects that can be used as matrices. 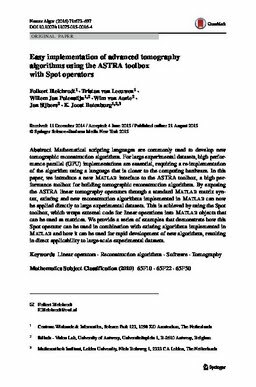 We provide a series of examples that demonstrate how this Spot operator can be used in combination with existing algorithms implemented in Matlab and how it can be used for rapid development of new algorithms, resulting in direct applicability to large-scale experimental datasets.